We are leading service provider of all type of Soil Resistivity Testing Services. Soil resistivity testing is the process of measuring a volume of soil to determine the conductivity of the soil. The resulting soil resistivity is expressed in ohm-meter or ohm-centimeter. Soil resistivity testing is the single most critical factor in electrical grounding design. Our organization is indulged in providing Soil Resistivity Testing Service to our clients. Soil resistivity testing is the process of measuring a volume of soil to determine the conductivity of the soil. The resulting soil resistivity is expressed in ohm-meter or ohm-centimeter. 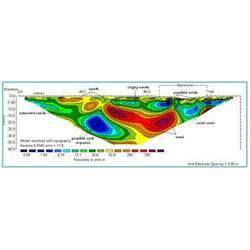 We are one of the reliable business organizations engaged in offering Resistivity Testing to our esteemed client. Resistance testing helps in providing information about conductivity of soil and its low resistance path of dissipation of current into the earth. 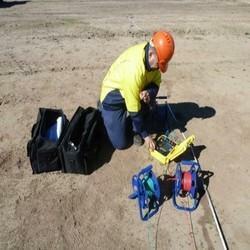 We discuss with the clients properly and offer reliable Soil Resistivity Testing. Experts provide best result by checking multiple samples. Also, with team of experts, we are able to offer this service in minimal time. To meet the variegated necessities of our respected patrons, we are engaged in rendering Soil Electrical Resistivity Testing Services. These services are accomplished under the guidance of well-informed experts who have prosperous industry practice and skill. We render these services at nominal prices. We are a well known organization, completely involved in imparting Electrical Resistivity Testing Services. The offered test is highly recommended before designing of grounding systems and systems that rely on passing current through the earth's surface. Advanced instruments are used by our experts for conducting this test. We are a well known organization, completely involved in imparting Electrical Resistivity Testing Services. The offered test is highly recommended before designing of grounding systems and systems that rely on passing current through the earth's surface. Advanced instruments are used by our experts for conducting this test. We are leading Soil Resistivity Survey service provide in Gujarat.